Red Dwarf is one of those sci-fi comedies that is an acquired taste for some. To me, I find it to be one of the prime examples of British humor. I can only catch it on the internet now through Netflix, but at least I can watch it. 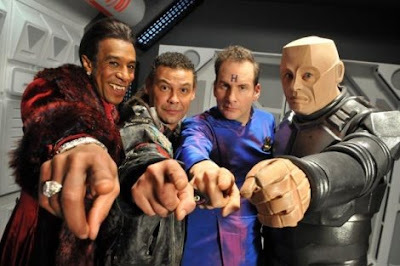 Now, the cast has reunited for "Red Dwarf: Back to Earth" special. I can't wait to see it. Unfortunately, I'll have to, again, try and catch it on the internet. Seems my cable company decided it wasn't worth keeping on BBC America.